The second in a new series of Health & Social Care seminars took place at Bishop Grosseteste University (BGU) last week. The seminar focused on supporting evidence-based Health & Social Care in Lincolnshire with a vision of seeing research in action. A broad spectrum of professionals and students from across Health & Social Care attended the seminar. These included representatives from charities, acute and community health trusts as well as students from BGU’s undergraduate and postgraduate Health & Social Care programmes. Professor Tanweer Ahmed (MBA, FICR), Director of Lincolnshire Clinical Research Facility Unit and Head of Research & Development at United Lincolnshire Hospitals NHS Trust (ULHT), delivered the key note. 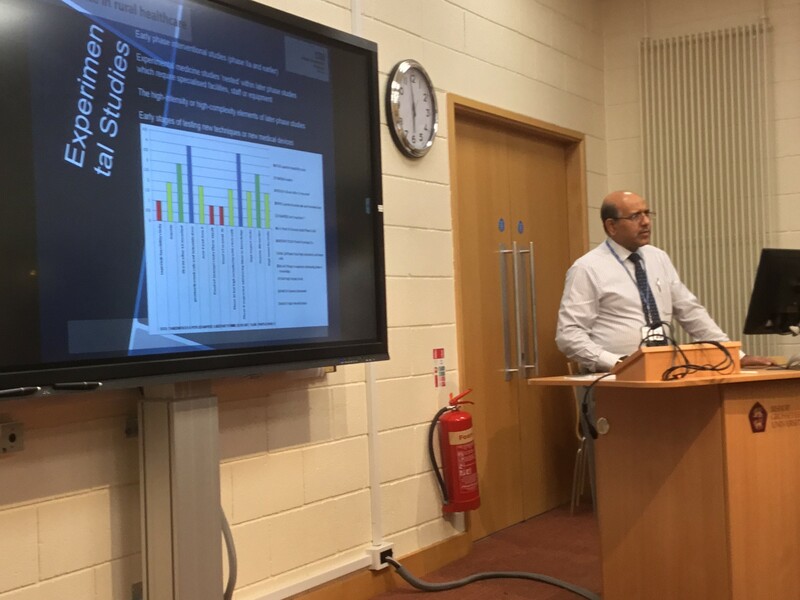 Professor Tanweer discussed the research objectives for the Trust and cited a number of studies that were currently being undertaken at ULHT. A number of questions were asked by the audience around patient informed research and implementation of research in practice. David Evans, Director of the Contact, Help, Advice and Information Network (CHAIN), gave a presentation about the network. CHAIN “is an online mutual support network for people working in health and social care. It gives people a simple and informal way of contacting each other to exchange ideas and share knowledge”. A number of attendees were already members but the majority had not heard of CHAIN. All agreed that belonging to a non-commercial community of individuals with linked interests was a real benefit and would enhance the community of research practice within Health & Social Care, especially within more rural counties such as Lincolnshire. The seminar closed with a practical demonstration of CHAIN and further networking. The next seminar takes place on 9 May 2018 and will feature BGU’s new LORIC (Lincolnshire Open Research & Innovation Centre) initiative who will be delivering the keynote: “Are you prepared for the 4th industrial revolution?” Contact Nicki Walsh for more details on nichola.walsh@bishopg.ac.uk. Find out more about studying Health & Social Care at BGU. American students from the University of Evansville in Indiana visited Bishop Grosseteste University (BGU) in Lincoln this week. A new monthly forum for nurses working in General Practice has been established at Bishop Grosseteste University (BGU) in Lincoln. Bishop Grosseteste University (BGU) in Lincoln hosted its inaugural Health & Social Care seminar last week.